Added 200 NUGT this morning at the open low, no fear here, but there is tons and tons of fear in the air, this could swing in an over night session and leave many jaws hitting the table. All is not well, I don’t care if the DOW goes to 50K…its good to have a hedge against the tsunami that is beyond the horizon. You might want to wait till we get past the GDP report tomorrow. That would seem to be the most logical trigger for gold to form its half cycle low. 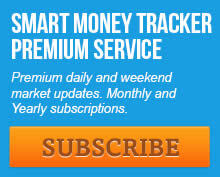 If the market continues to rise and accelerate it is a warning sign as the market itself is the sign of inflation. The higher it goes, but the better for gold IMO. Now we are getting into the real game, that is with the kind of volatility the manipulators like to inflict pain both ways. The drop has been very vertical, and it is reminiscent of the spikes mentioned before here. A bit surprised that was not mentioned here. Gold is already making higher highs and higher lows on a yearly cycle basis. That’s what I needed to see to confirm gold is in a new bull market. Gary, it seems that every time you mention that gold is in a new bull market, it falls some more. Gold is making higher highs and higher lows. What do you mean fall some more? Are we not looking at the same charts Gary? Since gold peaked out on July 6, it has made a series of lower highs and lower lows with the most recent low occurring on December 15. During that six month stretch, you never stopped talking about gold being in a new bull market and every time you said so, gold would ultimately drop more yet to a new low. It falls on a Friday, quadruple witching, just after FOMC. That’s my far out pick. I see big volume today. BTG, ABX. JNUG etc. Tells me big money may be moving in anticipating the move higher? So is 1220 the break out number since we bounced off 2-3 times? Ped, are you still hanging on to your DUST? BTW, nice call. Nope. She’s sold and I was happy with that trade. No losses this past two weeks although I too often leave money on the table either entering late or selling too early. So I am catching the middle range of moves. I bought JNUG this morning but in retrospect it was mistimed and too early. Plan to exit at any reasonable price a little later in the day. We have a bounce back coming in gold but it may not be until tomorrow or overnight. That should buoy the junior mining stock as usual. A steeper decline in metals should follow the next gold bounce. I am playing by ear though and trying not to get too far ahead of myself. Anyway, about the original gold call itself, I was pleased with how it turned out. I thought it was a nearly perfect technical set up for a price reversal and went to some lengths to get the word out on the site so others here might take defensive action. Not everyone wanted to hear that though and some people seemed to take it as an affront like I was dissing gold or something like that. My motives were honest though. I felt it was constructive to share my technical approach. For me it was very rewarding to hear that you had sold platinum at the top. That really made my day. Almost as much as getting the trade right for myself. I followed suite on jdst and saw signal but bought slightly light last night but made my share. Last year he said gold would turn at 1125 and thats what happened. He also gets it wrong but depends just on the price action with use of cypher patterns. I took a quick look at his posts. I looked for equity-related ones. He was way off in the latest one (6 days ago). Tells me he is a pure technical guy. Gold has been lagging the miners recently and that is a good thing. The miners should lead. However, as Gold nears resistance (potentially at $1250/oz) it is important for it to show relative strength against the other asset classes and in particular Bonds and FC. A breakout in the Gold/Bonds ratio would signal that Gold would be less affected by weakness in Bonds (and rising yields). Meanwhile, continued strength for Gold/FC would signal that Gold would be less impacted by a rising US Dollar. When focusing on the very short-term we see that Gold has been turned back at $1220/oz while the miners have continued to grind higher. They opened lower Wednesday but managed to close at the highs of the day. Their rebound is getting long in the tooth but there is a chance they could grind higher towards the red lines. Buying back some platinum positions. The PM sell off may be due for a solid rally. Still Valid. patience is key here, no bullish mistakes. Wait a little bit longer, preferred dates are 2-8th Feb! In the case of gold, do not get too exited if we break 1200, we are heading back south to retest mid Dec low and yes I sold my JNUGets at 9ish. Trying to get back in later. Mother nature likes to do things twice. If we manage to set a higher low that would be good news and we are off to the races for a substantial amount of time, maybe even longer than the 2016 rally. So you think gold is dropping $50 in the next week?! No I didn’t say that, a retest could end here at 1180? Why are folks so fixated by price, time as in timing is much more important. I will wait until FEBRUARI 2-8 to scale in my positions in JNUG. “we are heading back south to retest mid December low”? Those lows are 1124. That’s a $60 drop and you said feb2-8 so that leaves about a week or two to drop back down. What did I misread? the 1124 pricetag I do NOT expect a retest at 1124 thats false! Shorting more S&P. I think the party is just about over. So do I. But then I have said that before and been wrong. What makes you think its over Don? Party is over? May be. Everyone seems to be focusing on dia, spy, ndx. RUT has not been able to exceed the 1392.71 high made before 12 dec, 2016. SM is propped up by a few HW stocks. No clear sell signal yet, as far as I can see. YEPP agreed this is it a multi year decline is imminent! Big cycles is pointing downwards, esoteric trendlines is nestled within the top of US indicies. If Bonds has topped out and Stocks are next, what would that say about precious metals/commodities? Rising rates and bond yield is key factors for the Gold Bull! In other words gold and miner selloff not done! The new US Ambassador to the European Union appointed by Trump just said to short the Euro in 2017 because in a year and a half there won’t even be a European Union or a Euro in existance. WTF!!! You can’t make this stuff up. He is talking like Martin Armstrong now who basically made the same remark more than a year ago. In any case, if that happens it will mean the dollar does indeed soar since the Euro is such a large part of the currency basket. The implications for gold are twofold. First there would be downward pressure on all commodities if the dollar does go on to 1.20 or possibly 1.30 but secondly there would be a counter-intuitive trade because a collapsing Euro would drive gold demand mental all across Europe as their currency was devalued to junk. I think its even possible gold could go into absolute scarcity as a result and set prices on fire around the world since the Union is made up of more than 750 million people who would be hungry to protect the buying power of their savings. Anyway, read the story and you be the judge. I think we just got a sneak peak of the future though and it is very revealing. I agree 100% with your analysis Ped. Volatile times ahead. So its a buy gold/ miners signal. This is going to be one of those times that gold and dollars rise together. You know what else just occurred to me Strike? That if the Euro disappeared the Chinese Yuan would likely take its place and confirm the ascent of Asia in global currency markets. In two years time we might be doing technicals based on what happens in Shanghai instead of what transpires in Brussels. And there will be no headlines at all about Mario Draghi or the ECB. Instead we will be trying to divine what Xi just said and spending a lot of time on Google translate! In December 1989 the NIKKEI peaked. Many viewed Japan as the leading rival to the US economic system. But a quarter century later the true Asian power emerges. So keep shorting European Banks I suppose. All of this adds more insight into why the new Administration seems so anxious to disentangle itself from International Institutions. What the REAL message may be is that it is trying to disentangle from Europe primarily through Nato and the United Nations before they become a liability. There is going to be considerable pressure on the EU to hold itself together with that kind of backdrop. Don’t you just wonder if its all preordained? Any insight on what tomorrow’s GDP would mean for gold? Since I am on a bit of a roll here I want to put up a chart with what I see coming for tomorrow. Earlier I had mention that I entered JNUG but was a little too early. Anyway, part of the reason is that I think there may be something big brewing in stock markets and it comes down to a single chart. Today, the Nikkei has come within just 400 points of hitting major resistance near 20,000. Based on the hourly chart and Elliot counts it will make one last push to get there tomorrow and then we will see a sharp stock reversal. As you all know by now, most stock markets trade directionally together. So this reversal that may come as early as Monday will be a little more than interesting. But more to the point; as the Nikkei falls it will send the Yen up and with it goes gold and other precious metals. That is the correlation that has been in place for a long time already and it is still intact so don’t fight the tape on this one should it transpire. So we could indeed get a good, gold rally very soon and that’s why I have (at least temporarily) switched sides and bet long. You technical guys will want to view this futures chart on a “daily” and an “hourly” to get a glimpse of what may be coming. The set-up is very compelling and it is not on anybodies radar right now. What I think it is saying is that a stock market correction is near. And gold *could* make a big surprise move higher. Ped you on the dime! All I do is research as much of the view points and diverse opinions in markets(and some crap)! This point we have so many instruments that can give presently (as we all know) is just incredible and correlations (diversity of underlying indicators that manipulated figures can’t BS)that stand at all same previous points of collapse of the so called doom prophets (previously called crashes also)! It seems like a domino set up in popcorn masjien. And the first domino is going to go and it just a matter of when. It must be beyond the point of the manipulation if market start getting the wind of the flash of those dominos rather than the smell of popcorn in BS mirrors. I am actually amazed they could make it through 2016. With the EU, Japan is surely first that going to byte the dust with TTP thats off and Trumps mindset…mmm..man I see fire works soon! Nice observation PED. I hadn’t been watching the Nikkei but I do watch the yen:. I have been warning my friends about the coming collapse of Europe over the last 2 years- driven by the fact that a singular currency across many countries simply cannot work. These warnings have largely fallen on deaf ears. While I applaud European countries for striving for a better, more idealistic world, the sad truth is that monetary and fiscal policy has no one size fit all approach. OK I will. Thanks Terry. As an aside to my prior post on Japanese equities and a possible stock market correction I want to add that such an event could almost be classified as a Black Swan since NOBODY is expecting it. At least they are not expecting that a Nikkei top would be the trigger. Should gold reverse higher all of a sudden it would instantly validate the inverse Head-and-Shoulders patterns we now see on ETF’s like NUGT and JNUG. So I guess my comment here is just a warning of a possible reversal that had until now not really been considered and my prior bearishness on metals may have been misplaced (even if it was correct over the short term). Strong pullbacks like we have just seen can often lead to equally sharp reversals so I cannot rule out that the gold decline is almost at an end right here. Sure. Technicals go to trash in a crash. If there was really any warning nobody serious would get caught off-guard in the first place. There really is no technical indicators to tell you a large sell off has arrived. On the contrary, at peaks traders are mostly still bullish and complacent. By the way, there is another market in the warning zone for a reversal back down and that is the EuroStoxx which is just two hundred points away from a its own major resistance point. This one could also complete in a couple of trading day and I suggest we all stay apprised because the pattern has been in the making since 2009. What I am saying is that the EuroStoxx is about to hit the top of its channel. There could be fireworks coming. Any tells or thoughts on the gold:silver ratio? It’s been practically flat since mid Dec. I almost wish I had bought more before he close. The way NUGT ended on a low point suggests it could open tomorrow with a blast higher. I am surely not the only person who clued in that more than one major stock market is going to hit over head resistance within the next few days. So listen up everyone. This is a red alert on gold trading and stock markets. Will the Nikkei shoot right through resistance at 20,000 by Friday or will it bounce off that number and go down for a reversal? How about the DAX? Anyone here who follows it knows that it too is approaching a what will almost certainly be a double top. So what have we got here then? We have the DAX and STOXX both closing in on tops in the next two trading days, the Nikkei coming in at 20,000, the DOW that has just gone vertical these past 3 months and reached that same lofty number and the NASDAQ which itself is just a few points above its year 2000 high. We have topping stock markets on three continents all at the same time and all in the same week. It is possibly unprecedented too as they are all simultaneously overbought as they reach important technical turning points. Is it a coincidence? Well I wish I knew. Meanwhile the US Dollar has put in a daily outside reversal candle today telling us it is going back up. It is also in a pattern I think we could fairly call a double bottom. To me the odds seem almost astronomical that we don’t get a notable correction across all major markets by next Monday. For those who have taken bearish bets on gold and silver you still have tomorrow and possibly Friday to change your minds. I am out of the bear camp until further notice and plan to add to gold positions on any decent pullbacks tomorrow. I feel certain now that the Nikkei will lead and gold will be on its way back up as Yen falls / dollars rise. There is simply no other conclusion I can come too. I added 200 at the open low this morning Ped sitting on 6 lots . Trump has the benefit of the doubt currently. Common sense indicates that it would take at least a few weeks/months to find him wrong. But being a dealer the thing could linger, or he simply can be right. I do not want to be surprised by a SM collapse so today I removed a good chunk of my retirement funds from the SM. i’d also advise opening a forex account and diversifying into several different currencies. AUD, JPY, SGD and CNY (via ETF tracker) for starters. Terry, thanks for the note. USD should top on or before day 8. We could see a 3-5 day top between 101-102. Gary and I must use a very different cycle counting methodology as my Trading or Daily Cycles have been running 20-30 days for years now and nothing has changed in my book. Occasionally one stretches to the mid 30’s but I have not seen any cycle approaching 40 days for some time. My expectation is that Gold may now test the 50% Fib level and perhaps the 62% but I do expect a short term TC Low or DCL perhaps next week. Surf 1 more thing. If gold hits the 62% wouldn’t that be sort of bearish? And maybe the next daily cycle forms as left trans or do you expect the next cycle to move past 1220? A spike down to the 62% level and an intraday reversal would not be bearish in my book. Typical shake out move but we may not see a retrace to that level based on Time. Much depends on how long the USD bounces and to what price level. Interesting. Ped’s tantalizing theory calls for the possibility of a big Yen appreciation imminently. 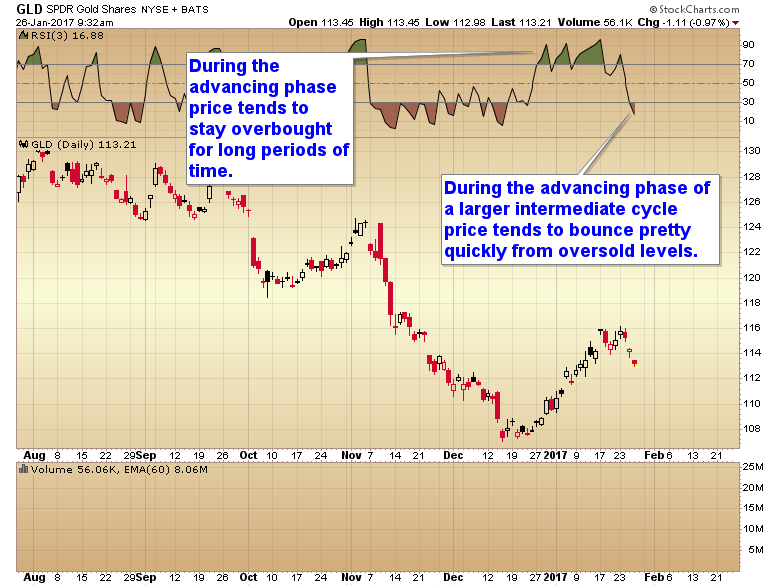 Surf’s charts suggest a 15 year dollar top in 2017, most likely in a few days. I love outlier theories that support each other, making the unlikely perhaps more likely. If it happens look for another big IC run – maybe bigger than last year’s 10x NUGT / 15x JNUG run. Tomorrow we have the GDP report. So we need to wait for the news. Then next week we have the FOMC meeting 31-1. A wise investor would wait till the news hit on February 1st. Many of us are expecting a sudden rise any time. But we can be dead wrong. That we have a bull market is true. The problem is that we do not know how long it will take to rise, and all the zig-zags of the movement. If it gets to $1140 it would be a steel; so do not expect it. On December 2016 we clearly had an extreme which hardly will repeat; look at the SPX/gold ratio to show it. I got one lot of NUGT shares today, and will start getting more depending on the action. It is the same thing as on December 2016, the same dilemma but tougher. So the middle way is the answer. Though we have another problem, this 32% drop does not show we are in a fantastic bull market. It has little time to prove itself. The belief is that if by March 30 gold does not reach $1300 we will have another failed year. Oh, if you want to do well, follow either Gary or learn from Dday. Gary, has lots of experience, is prudent, and is making money. Dday is a solid trader, no emotions, no haste, trades by the book and must be making lots of money. Do not follow Pedestrian or Goild as we do not use hard stops!!!! Though we are also making money. Don’t worry too much about me Robert. This one is going to be low risk until I see evidence that Yen actually reverses. The original forecast I made for gold to fall is still intact and the chart looks exactly as I had identified as it falls in a manner mirroring the angle of the rise since December. On the other hand, expect the unexpected. I don’t really know what tomorrow might bring and neither does anyone else. We just do our best with the information available and try to play the odds. And odds are good the Nikkei doesn’t break out of its resistance line on its first try. Look at a weekly chart of JPY/USD and find the support level for yourself using the lows of 2015 and 2016. You see Robert, what I had been looking at all along was not really obvious to me at first. But we are near the support line right now. There is perhaps no more than 5 to 8 trading days before we hit bottom near .85 and change on Yen/USD. And that means gold will start to rise again. It may well explain the stealth rise in gold stocks that is taking place in spite of this recent gold decline. Surely you have noticed that miners are resistant to the decline and some charts are damned bullish. So the more I started checking between charts yesterday the more I realized they were lining up for gold to bottom at a higher level than I first projected. And yes, I may be early on this trade and that’s OK with me as I shift my focus back to actual mining stock rather than the ETF’s. But I sure as hell do not want to miss out on a trend reversal when it hits bottom though and I now believe gold will indeed reverse higher and that the reversal will come about because stock markets could soon go soft. So bear with me as I sort this out Robert. And welcome to my analytic world where we talk out loud to strangers online and attempt to sort through the noise in real time. Trading is messy and unpredictable. After making such a negative forecast a few weeks back though I felt it was my duty to warn that I might have drawn an excessively generous conclusion on how deep this correction might go. Its great that I have been rewarded by being right so far but I need to be able to adjust my outlook as the information changes. In that way I might stay on the correct side and not box myself into programmed thinking of my own creation. And now you understand why I prefer short term trading. Stock markets change like the weather. Well a 32% drop is not small potatoes. Somehow if I want to get loaded again I need to start. Hardly is wise to buy too many shares at once, and is hard to do. The Livermore approach works better. If it goes down I just keep reducing my price day trading, and then I get a better price for other lots. However, the situation might be grim. It is likely that to stop the SM we will see another rate hike, and likely gold will continue to sink, perhaps to the %1160 level. Let see how the news break tomorrow at 8:30 AM. You cannot predict things like that. Whether they raise rates or not, price could move either direction.